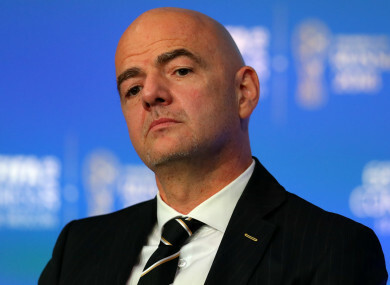 FIFA PRESIDENT GIANNI Infantino predicts the 2022 World Cup will be the “best ever” despite a continuing lack of clarity over the number of teams involved and where matches will be played. Qatar’s awarding of the tournament was controversial due to the country’s lack of football heritage, poor human rights record and hot weather that resulted in a switch from the typical June-July dates to November and December. In August, Qatar’s World Cup bid team denied allegations it conducted a smear campaign to increase their chances of hosting the 2022 tournament, having succeeded ahead of competing bids from the United States and Australia. “I think that all the ingredients are there to make the World Cup in 2022 an unforgettable event,” Infantino told FIFA.com in an interview to mark four years to the start of the tournament. “It will be a very compact World Cup, all the stadiums are within a one-hour maximum distance from each other. “It will be a World Cup hosted by a country, which has all the infrastructure and the possibilities ready to welcome the world to Qatar. “I’m sure the experience of anyone going to Qatar will be amazing,” he added. “They will discover an amazing country, not only for the sunshine, the beaches and the sand, but also because of the football and because of the possibility to celebrate the best event ever. “Qatar is having eight stadiums and preparing for the World Cup of 32 teams; of course you don’t need to be Einstein to find out that it might be difficult to organise in eight stadiums in one country,” he said. Email “Fifa president Infantino predicts best ever World Cup in Qatar”. Feedback on “Fifa president Infantino predicts best ever World Cup in Qatar”.